» Applying Heart Failure Management to Improve Health Outcomes: But WHICH One? Applying Heart Failure Management to Improve Health Outcomes: But WHICH One? We report on our learning from many years of research testing the value of nurse-led, multidisciplinary, home-based management of heart failure. We discuss and highlight the key challenges we have experienced in testing this model of care relative to alternatives and evolving patient population. Accordingly, we propose a pragmatic approach to adapt current models of care to meet the needs of increasingly complex (and costly) patients with multimorbidity. Heart failure, multimorbidity, frailty, disease management, nurse-led intervention, home-based intervention. 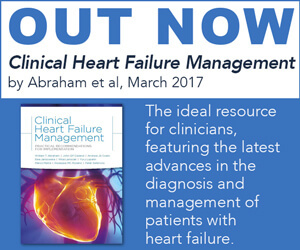 Primarily due to significant treatment advancements to prevent previously fatal acute cardiac events, the burden of heart failure (HF), characterised by chronic symptoms, acute hospitalisations and premature mortality, continues to rise.1,2 Latest expert guidelines3,4 confirmed by meta-analyses5,6 support the application of multidisciplinary HF management programs to improve health outcomes. These programmes, built on a patient-centric model of care,7 involve a congruent coordination of healthcare interventions specifically designed to optimise the management of individuals with HF. We report on our many years of work testing the value of a nurse-led, multidisciplinary, home-integrated approach in HF management and care. We reflect on and highlight the key learnings from our research programme and then propose a pragmatic approach to adapt the management of HF to meet the specific needs of increasingly complex (and costly) patients with multimorbidity. In the early years (mid-1990s) of developing the evidence-base for applying HF management there was a broad focus on simply demonstrating its efficacy. However, based on a series of seminal trials of multidisciplinary HF management, including those reported by Rich et al.11 and our subsequent reports on a nurse-led, home-based intervention (HBI),12,13 it was clearly demonstrable that these programmes (in multiple forms) could reduce the risk of rehospitalisation (HF and all-cause) and prolong survival relative to standard care.14,15 Despite subsequent attempts to replace face-to-face contacts with structured telephone support (STS) and remote management techniques,16,17 the results of an individual analysis18 of early trials demonstrating an in-person team approach (either applied via home visits or a specialist clinic) works best has held true. It is on this basis that our group, like those of the Coordinating Study Evaluating Outcomes of Advising and Counseling in Heart Failure (COACH) Investigators,19 started to examine how best to apply what works in HF management to maximal effect. Nurse-led, Multidisciplinary Management of Heart Failure Works: But Which One? Having reached the point of establishing the efficacy of HF management, as part of a broad network of collaborations with other health service research groups, we established the Which Heart Failure Intervention is Most Cost-effective (And Consumer Friendly) in Reducing Hospital Stay (WHICH?) trial group to examine which forms of HF management work best to improve health outcomes. To date, we have completed two WHICH? trials as part of a portfolio of >5 randomised trials evaluating different forms of HBI across the spectrum of heart disease. The head-to-head, multicentre randomised trial compared the efficacy of a home- versus specialist clinic-based approach to HF management in 280 typically older patients (71 +/- 14 years) with HF.20 Largely due to type II error (owing to lower than expected patient recruitment) we initially showed that a HBI was not superior to a clinic-based intervention in reducing all-cause death or hospitalisation during 12–18 months’ follow up.21 However, it was associated with significantly lower healthcare costs, attributable to fewer days of hospitalisation. Moreover, in the long term, HBI was associated with significantly prolonged survival (HR 0.62; 95 % CI 0.42–0.90) and reduced hospital stay (twofold less likely to be in upper quartile of hospital stay) compared to clinic-based care.22 Consistent with the most recent reviews,5,6 we continue to recommend that HF management programmes apply at least one home visit post-hospitalisation as part of the nurse-led multidisciplinary management of the syndrome. Most recently we reported on a multicentre randomised WHICH? II trial23 that compared the cost-efficacy of standard HF management (HBI or STS for metropolitan- and regional-dwelling patients as per local guidelines)24 versus a hybrid and intensified model of care designed to direct more care to those most at risk of poor health outcomes among 787 typically older patients with HF and multimorbidity. The latter group were initially profiled prior to hospital discharge according to the Green, Amber, Red Delineation of rIsk And Need in Heart Failure (GARDIAN-HF) tool25 to determine their level of risk of premature mortality or recurrent hospitalisation. All metropolitan-dwelling patients plus those remote-dwelling patients initially categorised as GARDIAN-HF Red (high risk) received a home visit to reassess management (revision of GARDIAN-HF status). A combination of repeat home visits and STS calls were then applied accordingly, with brain natriuretic peptide levels monitored and treatment titrated where appropriate. The primary endpoint was healthcare costs at 12 months, and despite a substantial investment in profiling patient risk and applying a combination of home visits and STS calls in the ‘intensified’ group, there were no group differences in total healthcare costs. Indeed, all outcomes slightly favoured standard HF management. One of the key challenges to further enhance the benefits of our model of HF management (HBI) is the possibility of a ‘threshold effect’, whereby additional holistic support, surveillance and advice (with the prospect of invoking the previously described phenomenon of a counter-productive ‘clinical cascade’ effect)26 may limit any further benefits from applying a more intensified intervention. In other words, a ‘less-is-more’ rule applies. Moreover, a solitary HF diagnosis is becoming increasingly uncommon, with the syndrome often presenting amongst multiple comorbid conditions, challenging healthcare systems worldwide.10 In the WHICH? II cohort, approximately 88 % of patients had ≥3 comorbid conditions. On this basis, we have recently demonstrated there is potential for worse outcomes when HBI is applied to older patients with high levels of multimorbidity.27 Our preliminary subanalysis of the WHICH? II outcomes indicated a ‘malignant’ cluster of comorbidities (arrhythmias, respiratory disease and anaemia) is not only associated with significantly increased risk of 30-day unplanned readmission or death, but also with a higher mortality rate at 1 year. Identifying these key comorbidities is important for determining multidisciplinary care for this affected population with complex needs. Yet, the vast majority of HF studies mostly exclude patients with significant comorbidities or HF with preserved ejection fraction (due to limited therapeutic options), which would likely impact the treatment paradigm. Next Steps: What Will Work? As previously mentioned, with an increasingly ageing and multimorbid population worldwide, a more nuanced approach to HF management is needed now more than ever. Multidisciplinary management plans comprising HBI are currently being promoted as best practice to reduce recurrent hospitalisation and save healthcare resources.4 In the recently published and largest meta-analysis to date, Van Spall et al. assessed outcomes from 53 randomised control trials (including 12,356 patients) and found nurse home visits were effective in decreasing all-cause mortality and readmission compared with other organised care for HF.5 However, as noted, our research suggests that the effects of a HBI are not consistent amongst all patient groups, with age and multimorbidities co-influencing outcomes.27 We propose that this phenomenon be described as the ‘goldilocks effect’, where HF patients may be divided into three categories: simple, complex and highly symptomatic. On one end of the spectrum, simple HF patients (often younger and with fewer comorbidities) do not necessarily need a complex care plan and can be treated with a clinic-based programme. On the other end of the spectrum, highly symptomatic HF patients (often older and with multimorbidity) may be beyond the point of benefiting from a multidisciplinary care plan, instead requiring specialist palliative care services. It is the complex HF patients in the middle of the spectrum who might have the most to gain from multidisciplinary HF management, consisting of a combination of HBI, STS and telemonitoring. 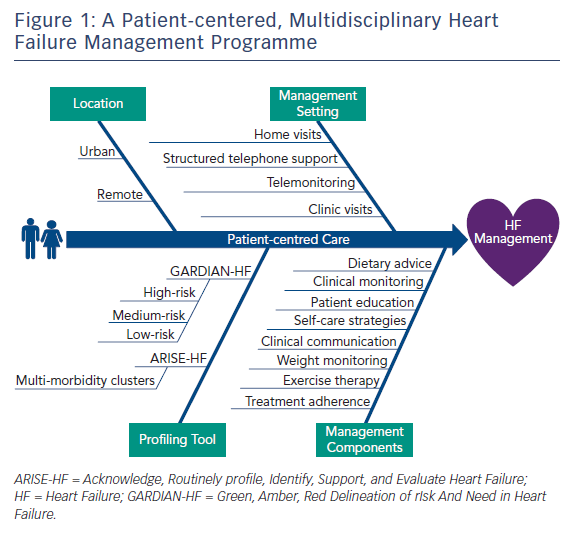 With this in mind, Figure 1 provides an overview of a multidisciplinary HF management programme that encourages practitioners to screen patients using the Acknowledge, Routinely profile, Identify, Support and Evaluate Heart Failure (ARISE-HF) approach (a clinical framework comprising five steps designed to improve health outcomes in HF patients affected by multimorbidity)10 and GARDIAN-HF25 tools, and classify them into stratified categories for subsequent care. Based on these categories, an appropriate HF management programme tailored to the individual (taking into account patient demographic profile, socioeconomic status, location, disease management components and disease management setting) can be established in collaboration with the patient. As demonstrated in the WHICH? trial, personal preferences play a role in the value, adherence and subsequent benefits that a patient may receive from a tailored HF management programme.28 Furthermore, the link between physical frailty (measured using handgrip) and cardiovascular-related mortality is being increasingly explored in research such as the Prospective Urban Rural Epidemiology (PURE) study,29 which in a patient population of 139,691 participants across 17 countries demonstrated grip strength was inversely associated with all-cause mortality, MI and stroke. This simple and inexpensive measurement of frailty could further enhance a risk-stratifying tool for HF patients. However, this proposal requires further investigation before being implemented. The overall value of nurse-led, multidisciplinary management of HF (incorporating home visits where possible) is largely incontrovertible. However, our experience with developing and robustly testing this model of care suggests a one-size-fits-all approach should not be routinely applied. A clinic-based model of care is probably more suited to younger individuals with less complex needs whilst HBI should be applied to the majority of HF patients. As consideration of specialist palliative management for much older patients with very complex needs is increasingly indicated, it is important that care providers develop a better understanding of the complex interactions between HF and multimorbidity. More innovative approaches to target specific clusters of multimorbidity are required to improve health outcomes and address the conundrum of increasingly complex patients and rising healthcare costs. Stewart S, Ekman I, Ekman T, et al. Population impact of heart failure and the most common forms of cancer: a study of 1 162 309 hospital cases in Sweden (1988 to 2004). Circ Cardiovasc Qual Outcomes 2010;3:573–80. Chen J, Normand SL, Wang Y, et al. National and regional trends in heart failure hospitalization and mortality rates for Medicare beneficiaries, 1998–2008. JAMA 2011;306:1669–78. Yancy CW, Jessup M, Bozkurt B, et al. 2017 ACC/AHA/HFSA Focused update of the 2013 ACCF/AHA guideline for the management of heart failure: a report of the American College of Cardiology/American Heart Association Task Force on clinical practice guidelines and the Heart Failure Society of America. J Card Fail 2017;23:628–51. Van Spall HG, Rahman T, Mytton O, et al. Comparative effectiveness of transitional care services in patients discharged from the hospital with heart failure: a systematic review and network meta-analysis. Eur J Heart Fail 2017; epub ahead of press. Feltner C, Jones CD, Cené CW, et al. 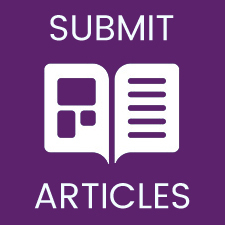 Transitional care interventions to prevent readmissions for persons with heart failure: a systematic review and meta-analysis. Ann Intern Med 2014;160:774–84. Coleman K, Austin BT, Brach C, Wagner EH. Evidence on the chronic care model in the new millennium. Health Aff (Millwood) 2009;28:75–85. Clark AM, Savard LA, Thompson DR. What is the strength of evidence for heart failure disease-management programs? J Am Coll Cardiol 2009;54:397–401. Salive ME. Multimorbidity in older adults. Epidemiol Rev 2013;35:75–83. Stewart S, Riegel B, Boyd C, et al. Establishing a pragmatic framework to optimise health outcomes in heart failure and multimorbidity (ARISE-HF): a multidisciplinary position statement. Int J Cardiol 2016;212:1–10. Stewart S, Pearson S, Horowitz JD. Effects of a homebased intervention among patients with congestive heart failure discharged from acute hospital care. Arch Intern Med 1998;158:1067–72. Stewart S, Marley JE, Horowitz JD. Effects of a multidisciplinary, home-based intervention on unplanned readmissions and survival among patients with chronic congestive heart failure: a randomised controlled study. Lancet 1999;354:1077–83. Inglis SC, Pearson S, Treen S, et al. Extending the horizon in chronic heart failure: effects of multidisciplinary, home-based intervention relative to usual care. Circulation 2006;114:2466– 73. Pearson S, Inglis SC, McLennan SN, et al. Prolonged effects of a home-based intervention in patients with chronic illness. Arch Intern Med 2006;166:645–50. Ong MK, Romano PS, Edgington S, et al. Effectiveness of remote patient monitoring after discharge of hospitalized patients with heart failure: the better effectiveness after transition - heart failure (BEAT-HF) randomized clinical trial. JAMA Intern Med 2016;176:310–8. Böhm M, Drexler H, Oswald H, et al. Fluid status telemedicine alerts for heart failure: a randomized controlled trial. Eur Heart J 2016;37:3154–63. McAlister FA, Stewart S, Ferrua S, McMurray JJ. Multidisciplinary strategies for the management of heart failure patients at high risk for admission: a systematic review of randomized trials. J Am Coll Cardiol 2004;44:810–9. Jaarsma T, van der Wal MH, Lesman-Leegte I, et al. Effect of moderate or intensive disease management program on outcome in patients with heart failure: Coordinating Study Evaluating Outcomes of Advising and Counseling in Heart Failure (COACH). Arch Intern Med 2008;168:316–24. Stewart S, Carrington MJ, Marwick T, et al. The WHICH? trial: rationale and design of a pragmatic randomized, multicentre comparison of home- vs. clinic-based management of chronic heart failure patients. Eur J Heart Fail 2011;13:909–16. Stewart S, Carrington MJ, Marwick TH, et al. Impact of home versus clinic-based management of chronic heart failure: the WHICH? (Which Heart Failure Intervention Is Most Cost- Effective & Consumer Friendly in Reducing Hospital Care) multicenter, randomized trial. J Am Coll Cardiol 2012;60:1239–48. Stewart S, Carrington MJ, Horowitz JD, et al. Prolonged impact of home versus clinic-based management of chronic heart failure: extended follow-up of a pragmatic, multicentre randomized trial cohort. Int J Cardiol 2014;174:600–10. Scuffham PA, Ball J, Horowitz JD, et al. Standard vs. intensified management of heart failure to reduce healthcare costs: results of a multicentre, randomized controlled trial. Eur Heart J 2017;38:2340–8. Carrington MJ, Kok S, Jansen K, Stewart S. The Green, Amber, Red Delineation of Risk and Need (GARDIAN) management system: a pragmatic approach to optimizing heart health from primary prevention to chronic disease management. Eur J Cardiovasc Nurs 2013;12:337–45. Mold JW, Stein HF. The cascade effect in the clinical care of patients. N Engl J Med 1986;314:512–4. Stewart S, Wiley JF, Ball J, et al. Impact of nurse-led, multidisciplinary home-based intervention on event-free survival across the spectrum of chronic heart disease: composite analysis of health outcomes in 1226 patients from 3 randomized trials. Circulation 2016;133:1867–77. Whitty JA, Stewart S, Carrington MJ, et al. Patient preferences and willingness-to-pay for a home or clinic based program of chronic heart failure management: findings from the Which? trial. PLoS One 2013;8:e58347. Leong DP, Teo KK, Rangarajan S, et al. Prognostic value of grip strength: findings from the Prospective Urban Rural Epidemiology (PURE) study. Lancet 2015;386:266–73.